Brussels (VNA) – National Assembly (NA) Chairwoman Nguyen Thi Kim Ngan held talks with President of the European Parliament (EP) Antonio Tajani in Brussels on April 4. Ngan thanked the EP leader for his contributions to the strengthened partnership between Vietnam and the European Union, as well as between the Vietnamese NA and the EP. She expressed her belief that Tajani will continue playing a key role in the promotion of ties between the EP and Vietnam in the future. 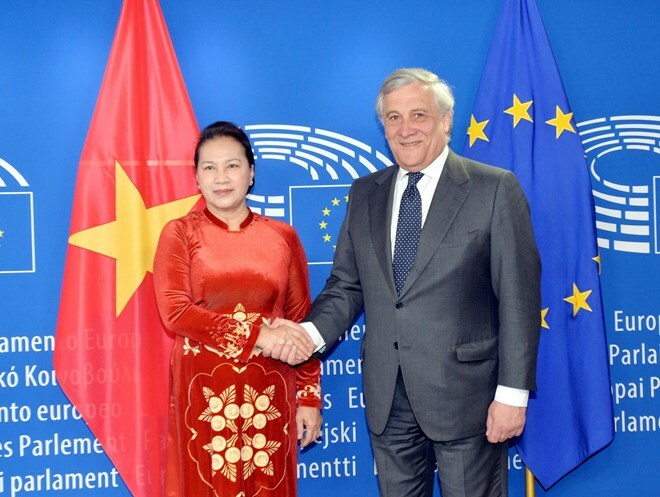 Welcoming the Vietnamese top legislator’s visit, Tajani said that the EU and Vietnam have shared a sound political and economic partnership, with the EU currently a large trade partner of Vietnam. Noting that the EU offered Vietnam 400 million EUR for socio-economic development, he said that this is evidence of the EU’s efforts in promoting collaboration with Vietnam. The EP President lauded the attempts by Vietnam and ASEAN countries in general in dealing with intra-bloc differences, as well as regional matters. Briefing her host on the socio-economic situation in Vietnam, Ngan said that Vietnam has signed and implemented 12 free trade agreements and is negotiating for four other deals. The EU is currently the fourth largest trade partner, second biggest export market, and fifth largest investor of Vietnam, she noted. The Vietnamese NA leader said that in order to further promote economic, trade, and investment partnerships, the two sides have concluded negotiations and processing for the signing and ratification of the EU-Vietnam free trade agreement (EVFTA) and the Investment Protection Agreement (IPA). NA Chairwoman Ngan said the EVFTA and IPA will bring multi-faceted benefits to both Vietnam and the EU, adding the early signing and ratification of the EVFTA will open up many opportunities to realise the benefits that the agreement will bring to both two signatories. The Vietnamese top legislator hoped that EP President Antonio Tajani would further his support so that the EVFTA ratification can be put into the EP's agenda at the beginning of the new tenure. She affirmed that Vietnam always facilitates optimal conditions for foreign enterprises, including those from the EU, to land investments in the country. Vietnam honours international trade commitments and creates equal opportunities for both domestic and foreign investors, she said, adding that Vietnam stands ready to discuss issues of mutual concern with the EU to put forth the signing and ratification of the EVFTA and the IPA. Tajani stressed that the EU attaches importance to the two agreements as they are significant to competent parties. He added that, in his role as EP President, he has done his utmost to accelerate the signing and ratification of the deals. All issues related to the pacts will be considered after the EP completes its election procedures and begins a new term, he added. NA Chairwoman Ngan and EP President Tajani expressed their delight over the sound relations between the Vietnamese NA and the EP, with various delegation exchanges and experience sharing in law building, among others. Chairwoman Ngan affirmed that Vietnam is willing to exchange information with and welcome EP parliamentarian groups, as well as organise dialogues with them to discuss issues of mutual concern in the spirit of cooperation and construction, thus helping the EP better understand the situation in Vietnam. She hailed the active operation of the two sides’ friendship parliamentarians’ groups, which helps promote the cooperative relations between Vietnamese NA and EP in particular, and between Vietnam and EU in general. The Vietnamese top legislator asked the two friendship parliamentarians’ groups to continue cooperating by sharing information and experience in the field. President Tajani said the EP welcomes Vietnamese National Assembly delegations to visit and work with the EP agencies. He added that the talks hold significant meaning, illustrating Vietnam’s determination to cooperate with the EU, especially as more European investors are seeking cooperation opportunities in Vietnam.